We welcome new students and are excited that you are considering enrolling your child in our school. We look forward to sharing our love of Irish dance and culture. We offer classes for students ranging in age from 4 through college age! It is never too early or late to learn the basics of Irish Dance! We hold Irish Dance New Beginners introductory sessions two times per year usually- in September and April. 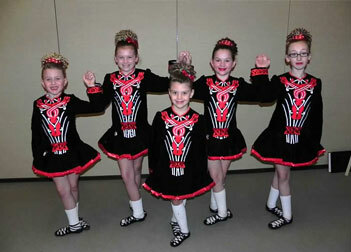 Learn what it means to be part of O’Grady Quinlan Academy of Irish Dance. If you have any questions, please email us at ogqteachers@gmail.com and put new beginner in the subject heading. If you are a student enrolled at a different An Comisiun certified school and you are interested in switching to OGQ, please email Colleen at OGQteachers@gmail.com. Please know, when you switch schools you will incur a 6 month ban on competition. Would you like to try a summer camp? – Check back for more information. Q: How do I dress my child for the first class? A: A t-shirt and shorts are appropriate dress for dance class. After two months of dancing, they will be asked to purchase the school uniform. This allows you time to see if your child is going to continue dance before purchasing! Q: Will my child need to have shoes and if so, where can they be purchased? Q: What time should my child arrive? A: You should show up 5-10 minutes before your scheduled time. Please adhere to the parent observation policies of each location. Parents are welcome to wait in the designated parent waiting room at our Easton Location and in the hallway or waiting area of the Allentown Ballet Studio. Q: Will my dancer be allowed to take a drink to class? A: All dancers receive a water break at class. Please remember to only bring water! We do not want sports drinks, juice or milk in the studios. Please label their water bottles. Q: How often should my child practice at home? A: All dancers should practice at home but the length of time depends on the age of the child. Your teacher will guide the parents or send home practice hints and suggestions. Q: What music can my child practice to and where can I purchase it? A: There are many songs that can be downloaded on to your i-tunes account to help your get their steps in time with the music. Be sure to download the proper beginner speeds. If you would like to download an entire album…David Lindqust – Step this Way has a lot of the songs at the correct speeds. Q: When is my child ready to dance out or compete? A: It all depends. It will be your choice if you want your child to participate in community events or to compete in competitions. Everything is voluntary! We want your child to love Irish Dancing and we will do everything in our power to foster a love of dance in a structured, yet positive environment. There are students who love to compete and students who choose not to – and that is fine! Every dance family may set their own journey. At the end of the year there is a recital for the entire school. Beginner Participation in the recital is optional by highly suggested! Q: When will my child begin hard shoe lessons? A: Generally, it takes about 6 months to a year of dancing before your child will be ready to start classes in hard shoes. Students must learn the foundation of the soft shoe style of dancing prior to embarking on the hard shoe path. Please that one of our location Allentown does not allow hard shoe dancing on their floors therefore, our Easton Studio is the best option for Hard Shoe Dancing. Q: How much are the hard shoes and where can they be purchased? A: Any beginner wanted to try out hard shoes should consider buying used shoes first. Please visit our used shoe bin in the Easton Studio. Do you have additional questions about New Beginner Irish Dance Classes? Please use our contact page to email us.